Serene environment, immense sailing opportunities and loads of fun and frolic awaits you at one of the most pristine beaches of Odisha namely Gopalpur on Sea. 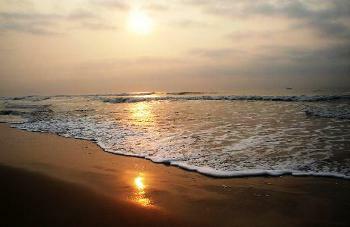 Located at a mere distance of 16 kms from Berhampur, this humming seaport can be a real retreat to the sea worshippers. Despite the crumbling walls and pillars of the jetty, that are a witness to a past glory of commercial activity; the beach offers peaceful ambience conducive to introspection and conviviality. 16 km from Berhampur, the Gopalpur-on-sea is a popular beautiful sandy beach. Clusters of coconut and palm trees, white sand dunes overgrown with casuarinas plantation separate the beach from the blue waters of the sea. During the days of Kalingas it was known as the port of Paloura from which traders sailed as far as Java, Bali and Sumatra and piled up wealth dealing in silk and pearl. Later it was a transit point to export sugar and cheap labourers for the tea gardens of Assam in north eastern India. The crumbling walls and the pillars of an ancient jetty together with some crumbling bungalows are witness to its swinging maritime past. The beach with its golden sand of the blue sea has its own sleepy charm. The beach is a very quite and comparatively clean place to swim and sun bathe, but take precautions because of treacherous undercurrents. Watching Gopalpur's endless empty shoreline getting swarmed with fishermen with their hand-nets full of catch is interesting and enjoyable to while away time in the stunning stillness. Whether it is the rising Sun over the azure waters or the rhythmic lapping of waves shimmering in the bright moonlight, it is an enduring experience. The old lighthouse open to visitors each afternoon, but for a very short duration, offers good views.